Since 1982, Road Race Management has been the industry’s leading resource for the dissemination of information and exchange of ideas among those who produce running events of all sizes. Our publications, website and meetings have helped educate thousands of race officials over the years. We have expanded on our heritage of long- time support of the running industry by offering RRM memberships that combine our comprehensive information resources with a money-saving member benefits package. Through the 11-times yearly newsletter, website and ewires, we will keep you up to date on current issues facing race organizers, as well as sponsorship, marketing, insurance and legal issues, drug testing, elite athlete recruitment, trade news, happenings at RRCA, USATF, IAAF, Running USA, PRRO and other organizations, all while saving you hundreds of dollars on RRM publications and our annual meeting. Up to 25% Discount on a new or existing Constant Contact account. Click Here for Details. Being part of an organization that supports race directors and the running industry by annually honoring and rewarding the MarathonFoto/Road Race Management Race Director of the Year (presented by MYLAPS) and MarathonFoto/Road Race Management Lifetime Achievement Award Winner, and by being a partner in the RRCA Race Director Certification Program. RRM's Organizing Running Events is the textbook for the course. 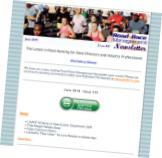 Road Race Management Newsletter is an electronic, information-packed newsletter published 11 times per year and e-mailed to all Road Race Management Members. It is provided free to all Road Race Management members. The newsletter provides accurate and timely coverage of issues critical to race planning and management, plus late-breaking news of interest to the race-directing and running community. Is Someone in Your Organization Already a Member or Joining Now? If so, that RRM Member May Add up to Two (2) Additional RRM Members for just $59. (The two additional members must be part of the same Organization or Company as the current RRM member.) Just call Phil Stewart at 301-320-6865 or send an email to pstewart@rrm.com for details and to add the additional members.